The Raven is a perfect example of a classic Hollywood horror film where virtually the entire pleasure of the film rests on its central actors, two icons of horror cinema: Bela Lugosi and Boris Karloff. This duo, together and separately, were responsible for much of the appeal of so many of the era's low-budget throwaways. They infused these otherwise disposable films with the timeless quality of their performances. Sometimes, these two — particularly Karloff, who was far more versatile an actor than he has ever gotten credit for — could elevate a film by locating unexpected drama, pathos and depth in their mad scientists, monsters and killers. Perhaps more often, their broad, campy performances could bring a spirited energy and intensity to films that would otherwise have been merely flimsy, poorly constructed B-movies. The Raven certainly doesn't have much to recommend it beyond the appeal of its dueling central performances; as was so often the case when Lugosi and Karloff met onscreen, they are pitted against one another, Lugosi's smiling courtliness set off against Karloff's blunt, Frankensteinian strength. Lugosi plays Dr. Vollin, a brilliant physician who has now retired to conduct private research — and also to dedicate himself to his obsession with Edgar Allen Poe, constructing elaborate replicas of the death traps from Poe's stories in a hidden basement room. Karloff is the killer Edmond Bateman, escaped from prison and showing up on Vollin's doorstep, begging the doctor to perform plastic surgery on him, to transform his face. Vollin agrees, but instead he deforms Bateman beyond recognition, giving him a half-formed face with one staring, non-functioning eye and a melted texture to his skin. He needs Bateman's sinister services, and in order to ensure the escaped criminal's cooperation, he promises that he will restore his face only if Bateman helps him with his evil plot. Vollin desires revenge for being denied the great love of his life. He had saved the life of the pretty young dancer Jean Thatcher (Irene Ware), but she was already engaged to another doctor (Lester Matthews) and her father Judge Thatcher (Samuel S. Hinds) urged Vollin to back off. Vollin's not exactly a stable guy, and this is enough to drive him over the edge: he invites Thatcher and his family to his home for the weekend, plotting to use Bateman to exact his revenge. The plot is, obviously, beyond silly, really little more than a flimsy excuse to trot out some of Poe's elaborate torture devices, as well as providing a framework for Karloff and Lugosi's sparring. The film is strangely a bit like a Marx brothers movie, formally speaking, in that everybody else in the cast is playing it straight while the main characters are on an entirely different level. While Karloff and Lugosi are wildly gesticulating and enjoyably hamming it up, everyone else seems to be on the verge of falling asleep, and not just when they're exaggeratedly yawning to convey their sleepiness. It's like there are two different movies here, and nobody else seems to realize that there's a Gothic chamber horror story playing out in the basement, while up above the Thatcher family and Vollin's assorted other guests amiably sleepwalk through some melodrama and light comedy. Needless to say, whenever the focus is off Karloff and Lugosi, the film is simply dreadful, featuring some of the most stilted, painfully horrible line readings imaginable. The supporting cast is composed entirely of forgettable non-entities, including even Ware as the love interest; it's hard to imagine this drone, pretty as she is, driving anyone truly mad. The cast alternates between melodramatic overacting and barely acting at all, rendering the already minimal plot even more irrelevant. No, this is strictly a two-man show, and thankfully both Lugosi and Karloff rise to the occasion. The former is especially good here, playing Vollin with a smarmy self-righteousness and sense of entitlement, always tinged with a note of madness even before he really goes mad. He's a smiling sadist, fascinated with pain and torture: "toooortuuure," he drawls the word out in his signature Hungarian accent, savoring its every syllable, rolling it around on his tongue as though tasting it. There's a chilling scene where he clumsily tries to seduce Jean after her surgery, running his hand along her neck to examine her wounds. "Does it still hurt?" he asks her with a gleeful smile on his face, eying a surgical scar with the pleasure of a small child playing with a puppy. His broad smile is creepy; he takes such obvious pleasure in doling out pain. Karloff is equally good, playing a character with more dramatic and emotional shadings. His character is haunted by the things he's done, and obsessed by the idea that his crimes were a reflection of his ugly, brutish face: if only he could have a different face, he could be good. Instead, Vollin makes him even uglier, suited only to revenge and cruelty, using him as an instrument in his evil plans. Bateman is a poignant character, and Karloff conveys his despair with the use of only one eye and half his face, the other half frozen beneath thick makeup, an obviously fake eye staring dead ahead at all times. The makeup isn't necessarily convincing, but it's creepy enough to do its job, and the strength of Karloff's performance is such that after a while one forgets the makeup is even there. This is what Karloff unfailingly brought to these low-budget ventures, infusing his characters with depth and resonance far beyond what was called for, getting across his inner state even through the most formidable of barriers. His one good eye, casting desperately about as he tries to avoid further corruption, is all he needs to craft a powerful performance. The interaction of these two greats is all the film has to offer, but it's more than enough. It's a flimsy, utterly ridiculous story, flatly directed (by journeyman Lew Landers, on his first film) and hampered by the overall low quality of its acting. Even so, Karloff and Lugosi manage to craft an entertaining and even dramatically satisfying opposition between mad cruelty and a crooked man who desperately wants to change. Unlike its predecessor The Raven, Boris Karloff and Bela Lugosi's next film together, The Invisible Ray, was one even these legends couldn't quite redeem. The film has a convoluted plot and some absurdly funny science fiction contrivances, as well as special effects that pretty much guarantee its status as a camp classic of a certain kind. But in between scattered scenes of over-the-top silliness, it's surprisingly dull and monotonous, allowing much of its action to occur offscreen while focusing at interminable length on the least interesting aspects of the story. Karloff is the star of the show here, playing the brilliant but isolated scientist Janos Rukh, who has studied by himself for years, mocked and ostracized by the scientific community for his unconventional theories. Frankly, I'm still not sure what those theories are, though he goes to great lengths to explain them during the unintentionally hilarious opening scenes, when he presents a demonstration of his ideas along with some proof that he'd been right all along. Basically, he gathers together a group of scientists for a big planetarium show, projecting rays into space and somehow getting an image of Earth from the distant past, just in time to watch a big glowing meteor crash into the planet and land in Africa — just as Rukh had predicted, how convenient! The scientists, led by Rukh's rival Dr. Benet (Lugosi), then head off with Rukh into the interior of Africa in search of the mysterious meteor that crashed there so long ago. They drag along Rukh's wife Diane (Frances Drake), who married the much older Rukh out of respect for his intellect rather than genuine love — which doesn't exactly explain why her eye wanders, once in Africa, to the fey, annoying Ronald Drake (Frank Lawton, who can't quite suppress a silly grin throughout the film, as though bemused by his own career choices). Anyway, things quickly begin going wrong for Rukh. He discovers his meteor, but finds that it turns him radioactive and deadly, so that anything he touches will die. He also glows in the dark, a neat party trick rendered here with some of the laziest special effects ever trotted out for a Hollywood production. Benet is able to cure Rukh's radioactivity, but it's not permanent; Rukh has to continually take shots to counteract the effects of the meteor, or else he'll return to his lethal state before dying himself. Not long after, while Rukh is once again absorbed in his research, he finds that not only have Benet and the other scientists taken it upon themselves to report the discovery of the meteor, but Diane has left Africa, leaving him a note that she's in love with Drake. Rukh returns to Paris broken and enraged. He gets credit for the discovery of the miraculous "Radium X," which can cure all sorts of diseases when harnessed, but Benet and the other scientists wind up getting more attention for actually putting the substance to practical use. And in any event no amount of accolades are a consolation for seeing his wife with another man. So Rukh fakes his own death and begins stalking the other members of his expedition, killing them off one by one. 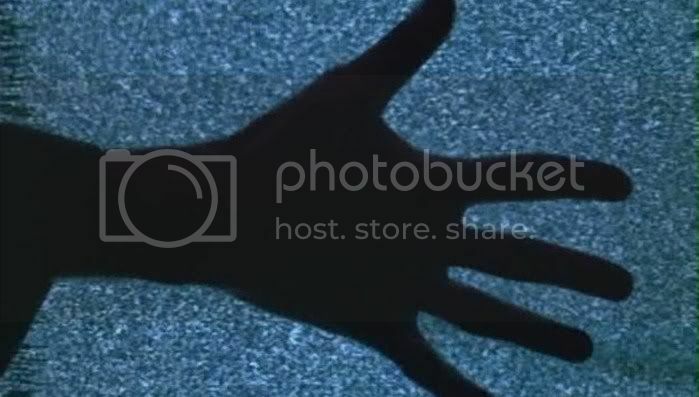 Despite the needless twists and turns of the plot, at this point the film's horror premise should kick into high gear, as Rukh tracks down his victims, merely touching them in order to infect them with his murderous radioactive emanations. This should make for a supremely creepy, horrifying movie. But director Lambert Hillyer, perhaps constrained by a limited effects budget, keeps the action almost entirely offscreen. Rukh's activities appear in newspaper headlines, but none of his murders are actually shown, nor are the incidents when he uses his invisible ray gun to symbolically destroys a set of church statues that represent, for him, his victims. This makes for a rather dull, plodding film, with a whole lot of exposition and irrelevant melodrama and build-up for suspense sequences that never actually come. Karloff delivers a fine performance as the slowly unraveling scientist, and in a more straightforward and secondary role Lugosi does his best, exuding a cool reserve as Rukh's rival colleague. He also presides over a great scene in which he reveals for some police inspectors the irradiated handprints on a murder victim's throat, one of the most memorable images (besides the glowing Karloff) from this mostly visually undistinguished film. This is a minor sci-fi/horror offering from Universal, and a minor pairing for Karloff and Lugosi, who despite their best efforts can't manage to inject any real vitality into this lackluster project. I watched virtually any horror movie I could get my hands on growing up. For some reason, though, THE RAVEN really creeped me out when I was a kid. I was probably in 5th or 6th grade... had definitely sat through HALLOWEEN and NIGHTMARE ON ELM STREET and not been scared at all. Yet, I remember actually running out of the room during this one... much to my family's amusement. 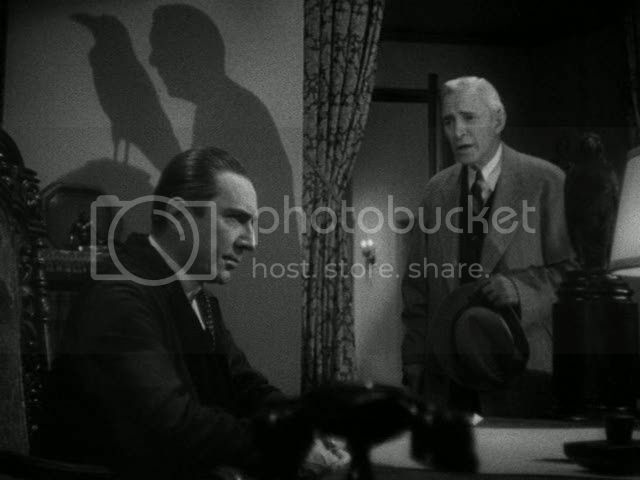 You know, I can see that happening -- Lugosi is really creepy in The Raven, with all those smarmy smiles of his, and his complete delight in toooortuuure. Thanks for stopping by, JM! "There are somethings that man is not meant to know"
Never has that hammy horror standard been given more ominous resonance than in THE INVISIBLE RAY, a film I must say I like and appreciate more than you do, as like "J.M." I grew up with this. A Chiller Theatre staple on Ch. 11 in the NYC area, this was a variation of sorts on the "Midas Touch" which boasted pretty fair science-fiction effects for its time, embellishing what was of course a rather silly story that was standard fodder in a thematic sense. The opening sequences of Rukh's castle and the dark, starry night echo th eorginal FRANKENSTEIN with machines and gadgets in abundance. 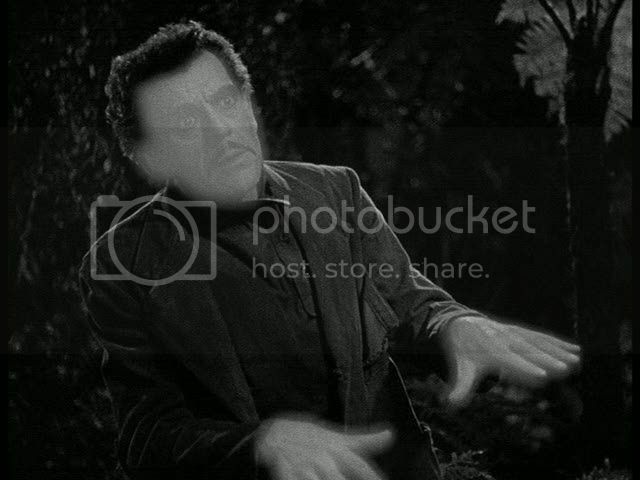 While Karloff is indisputable hammy, this quality is what makes the film as much fun as it is. Of course, Lambert Hillyer directed DRACULA'S DAUGHTER (also released in 1936). The story arc for me was not "dull and plodding" but most engaging, especially when the victims are tracked down. Almost reminds me of Vincent Price and THEATRE OF BLOOD, which takes the revenge motif to its highest level of originality. But THE INVISIBLE RAY, warts and all, is a fun pairing of the two horror icons, perhaps the most memorable co-starring vehicle for them aside from Ulmer's THE BLACK CAT (1935). Speaking of the Ulmer film, you review the one that many consider it's "companion piece," THE RAVEN, which you rightly dismiss. It's god-awful for sure, though as you note the two actors carry it through for some very modest worth. In no movie has the Edgar Allan Poe reference been so fraudulently conscripted. But again, I remember this film so well, as it was a Chiller Theatre regular, hence I can't even count the number of times I've set eyes on it. High-quality and exhaustive appraisals here. And it's quite rare to have that kind of attention for these films. I have to say, bad as it is in most respects, I much prefer The Raven to The Invisible Ray. The latter has its moments, but the former is just great campy fun with really over-the-top performances from both legendary leads. I had a blast watching it. The Black Cat, of course, is much better than either -- it's a genuinely great film in which its Gothic melodrama stands in for the horrors of wartime Europe. But then Ulmer was generally leagues ahead of most of his B-movie contemporaries. Ed, I've got a busy weekend (which I'll probably mention in the final post) so I haven't had a lot of time for reading and commenting but I just wanted to thank you for all your contributions and the dedication you showed in watching and reviewing movies exclusively for the blogathon this week. Really, it's incredible and I absolutely appreciate it greatly. Thanks again. Thanks, Greg. You've done a great job with this blogathon, I've had a lot of fun reading everything everyone's been doing, and watching and writing about all these old sci-fi movies all week. It was a great idea and you've made it a real success.